100% deposit match bonus up to £50 To claim "WELCOME BONUS", simply select it on the deposit page before proceed with payment! Welcome Bonus must be wagered 10 (ten) times on accumulator bets consisting of a minimum 3 (three) selections, minimum selection odds of 1/5(1.20), and minimum selections total odds 1/1 (2.00). T&Cs Apply. 18+. Please Gamble Responsibly. EnergyBet have introduced a great welcome offer for the UK customers which will match the initial deposit up to a maximum of ₤50. In order to qualify for this promotion, a minimum ₤10 real money deposit is needed. Furthermore, you must wager 10 times the bonus amount on accumulators consisting of a minimum of three selections (minimum selection odds of 2.0) in order to redeem your Sportsbook Welcome Bonus. Only bets placed with bonus funds are included in the wagering requirements and the offer doesn’t work in conjunction with any other offer. 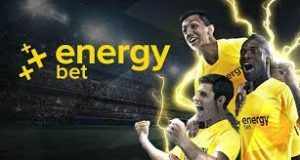 EnergyBet are a new UK bookmaker offering great odds, bonuses and promotions. DEPOSIT £50 AND GET A 100% MATCHED BONUS T&Cs 100% deposit match bonus up to £50 To claim "WELCOME BONUS", simply select it on the deposit page before proceed with payment! Welcome Bonus must be wagered 10 (ten) times on accumulator bets consisting of a minimum 3 (three) selections, minimum selection odds of 1/5(1.20), and minimum selections total odds 1/1 (2.00). T&Cs Apply. 18+. Please Gamble Responsibly. Football is at its best during the weekend and EnergyBet has a great offer for the customers. This promotion gives a refund on losing football multiples with four or more selections if just one of your picks lets you down. To qualify for this Accumulator Offer, you need to place a multiple bet with at least four selections, with minimum odds of 1.20 for each pick, and a stake of ₤10 or more. This offer now also includes NHL and NBA! If you stake £10 on a Weekend Premier League football match involving the match market you may qualify for a free bet. This is because at Energybet if your bet loses due to the game finishing 0-0 they will award you with a £10 free bet. This is also inclusive of accumulators. EnergyBet are also offering new customer a 100% first deposit bonus up to a hefty £150. Your first deposit must be at a minimum of £10 and in order to redeem the bonus you must wager the bonus and deposit amount 25 times. An example of this would be a £100 deposit results in a £100 bonus. This total of £200 would have to wagered to the value of £5000 on the Slots. They also offer a ‘Casino Reload’ bonus on your second deposit to the value of 50%. The maximum amount permitted on this reload is £150 whilst the wagering requirements on this bonus are at x30. The new customers should begin by clicking the yellow “Register” button on the top right of the homepage. This will drive players to a secure and easy registration process, where they will be asked for a unique user ID and a password, personal details and an e-mail address. Once all required information is provided, punters will be able to enter an EnergyBet promo code in a special box if they have it. After this is done, the process will continue by taking the customers to a section where they need to select a banking method to use and to make a first deposit in order to be able the place the first bets. Energybet have a few other unqiue promotions that change with regularity. One of those is the Slots tournament held every Thursday. Each player is competing for a share of 1000 Euro’s in Cash Rewards. The minimum spin value is 20 Cents you can play on any of the Play’n Go slots at EnergyCasino. You accumulate points which are based over 20 consecutive rounds. For more information on this bookmaker please see our comprehensive EnergyBet Review.